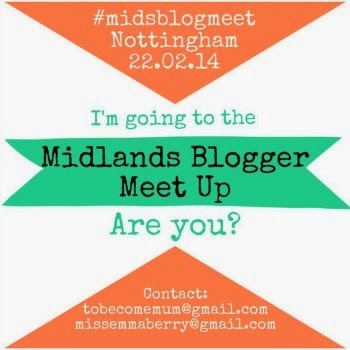 and yesterday Little L and I went to Nottingham to the #midsblogmeet hosted by Emma and Kelly. 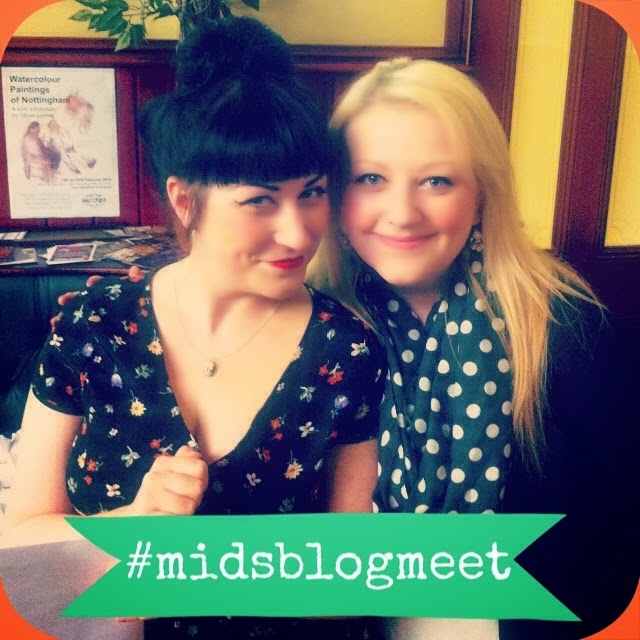 The meet was a mix of Lifestyle and Mummy bloggers (and some excited children too!). 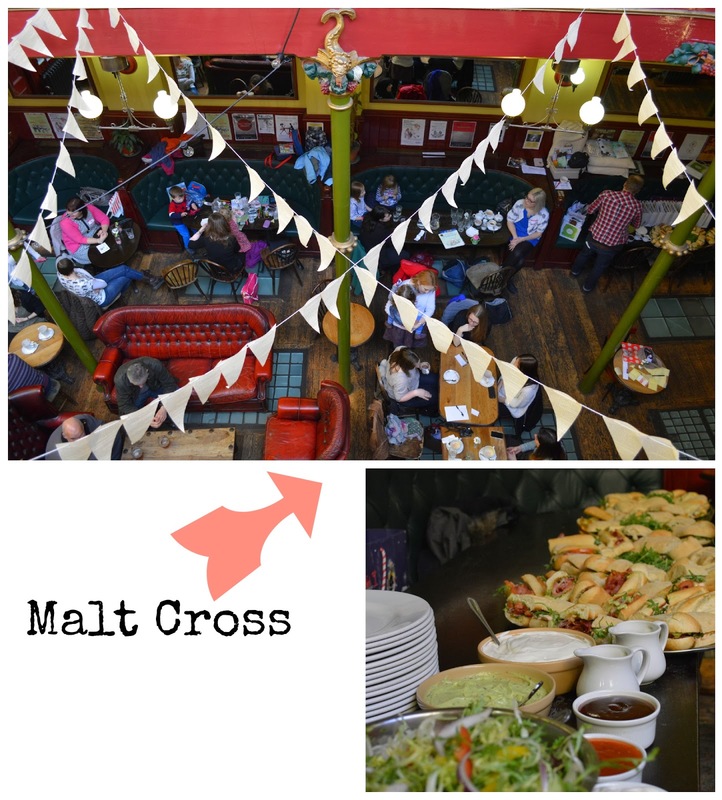 Our venue was the Malt Cross, a light airy cafe bar with fabulous old leather Chesterfields and a relaxed family friendly area. It had a really quaint vintage feel to it with the bunting, carved pillars and red and green colour scheme. I loved it! 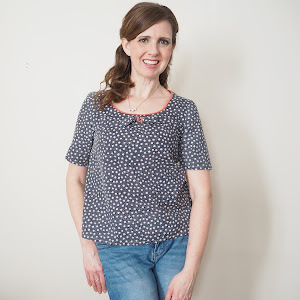 The Malt Cross host's crafty workshops also with paper and screen printing coming up soon. Plus being in the middle of the city it was just a stones through from the bus, tram links and of course the wonderful shops of Nottingham! 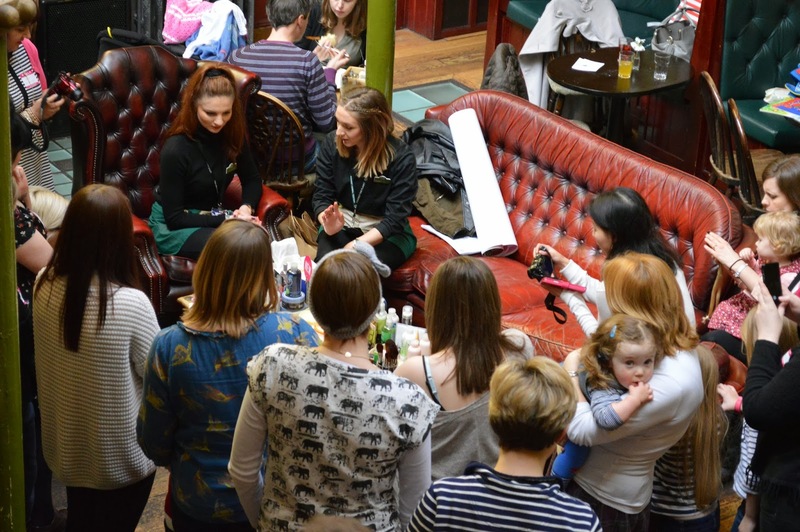 After getting to know each other over an enormous pub lunch, the Body Shop gave us a demo of the latest products. I grew up with the Body Shop and for most of us it was our first perfume! I remember the Strawberry and Mulberry scented bath products from my teens. It was great to see that they have up dated them with a new a Blueberry scent launching this Tuesday. I use the hemp cream on my skin and would recommend it for any new Mummy who is always washing her hands! I love what the Body Shop stands for and being vegetarian it was good to see products to try that are against animal testing. 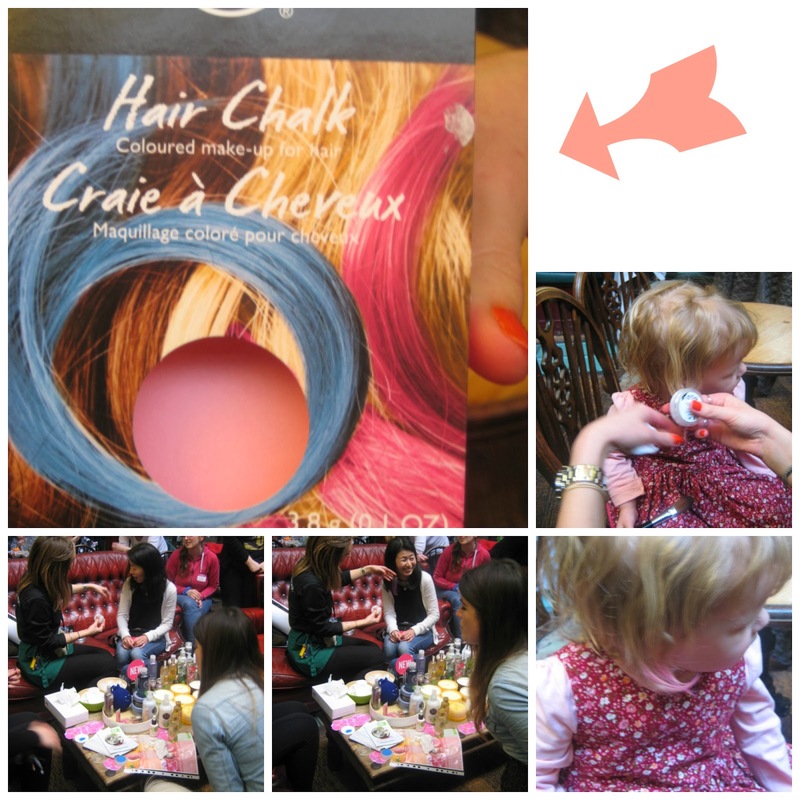 The product that we all loved was the new hair chalks which are perfect for dressing up the little ones without putting make up on their sensitive skins. Instead add it to their hair! 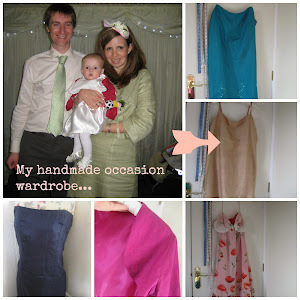 I feel a dressing up costume coming up! Little L looks lovely with her pink hair chalks in her hair. 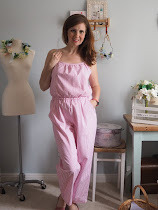 The Body Shop - oh we love you! After my little one had dipped her hands in most of the pots of gorgeous creams, we had a few giveaways prizes and a goody bag to take home! 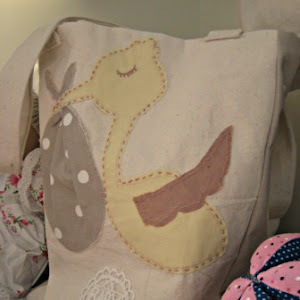 The bag included some loveliness to inspire future posts. 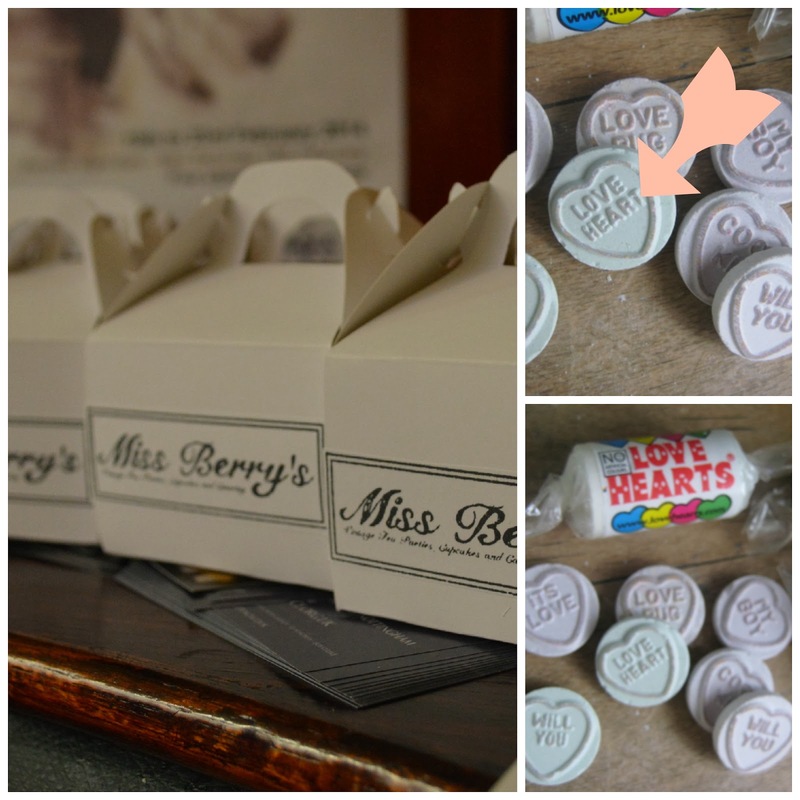 So as I write this, my family has already sampled Miss Berry's gorgeous cakes in pretty boxes and the Love Heart candies. I have to say I am super excited about the chocolate button moulds from Bakedbyme.net...I may need a shopping trip to get some chocolate later today. They look pretty amazing don't they? So, all myself and Little L want to say is a big 'thank-you' to our hostesses for the meet. This is our first Mummy and Daughter meet and it was awesome!